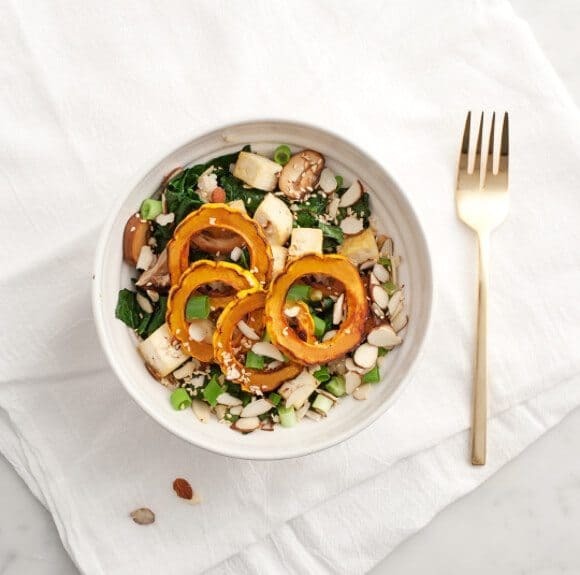 A cozy and healthy fall bowl made with roasted delicata squash & kale, sauteed mushrooms, and tangy ginger miso gravy. Great for a vegan/gf lunch or dinner. I just loved this ginger-miso gravy from The First Mess. It was so easy, fast and incredibly delicious. I didn’t have lemongrass, so the only thing I did differently was splash in a couple teaspoons of rice vinegar instead. Heat a bit of olive oil in a medium sized skillet. Add mushrooms, salt, pepper and the reserved bits from straining your gravy. Cook stirring occasionally until they're golden and soft, about 8-10 minutes. Deglaze the pan with a splash of rice vinegar, and continue cooking for another few minutes. Remove from the pan and set aside. 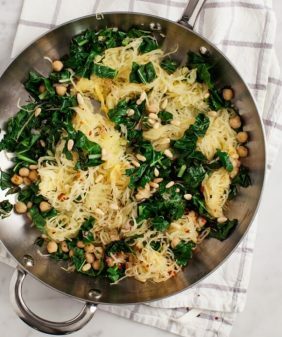 You can either chop and cook your kale in the pan with your mushrooms or roast it in the oven. 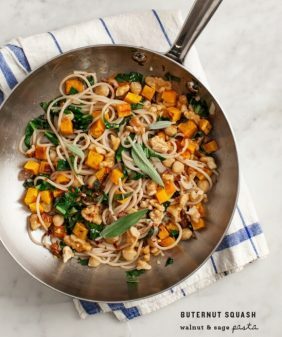 I have this new lazy technique where I take the whole bunch, drizzle it with a little olive oil and salt, and put the whole thing (bunched up) in the oven during the last few minutes of my roasted squash (for 5-8 minutes or so). Watch it and take it out when it's wilted and the edges are just a bit crispy. Remove from the oven and chop it. Assemble your bowls with rice, veggies, tofu, and sauce. Top with almonds and/or sesame seeds for crunch. your Indian version sounds amazing, can I come over? This looks absolutely delicious! I bookmarked the same recipe so it is nice to see it tasted great. 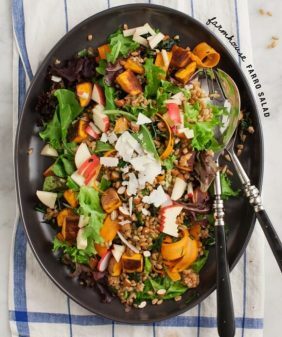 Btw, I am the same as you… for some reason my clothes are always tighter in the fall as I swoon over all the fresh local veggies… I calm myself over the winter months.. well, except when I stock up on squash but they keep for a while in my pantry. 😉 Can’t wait to try this out. My brown rice here probably has less protein than your wild rice which is why I like the protein addition. Many times I leave out the grain altogether for a lighter meal. Sounds delicious! 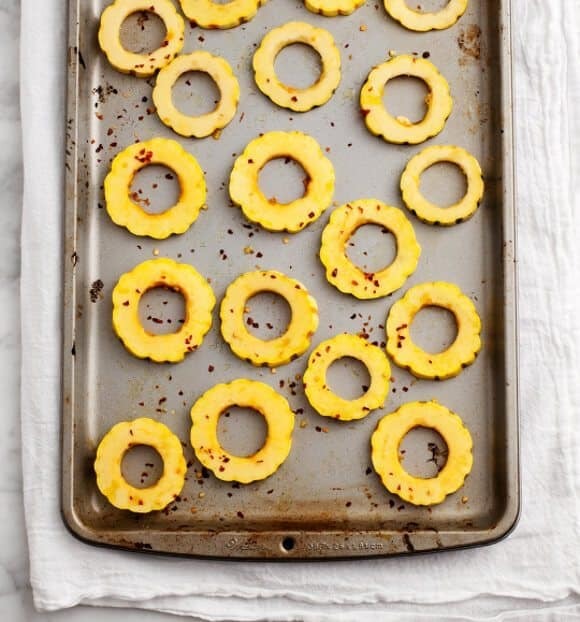 I’ve been eating a lot of delicata squash lately to test a recipe for Thanksgiving, and I also love cutting it into rings. So pretty. oh that looks delicious!! must try. This is great – the possibilities are endless! Some days I get in a rut with our vegan meals, so it’s always good to have a little inspiration to make something different! It looks healthy and delicious – I think I need some of this, we just ate a kilo of gummy bears in a few short days! I am 100% obsessed with your photos….and the recipes. 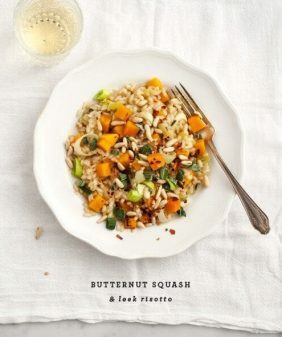 I will be stuffing a delicata squash tomorrow but need to try this soon. Ooh that sounds delicious! I just had delicata for the first time the other day, rousing it and dipping it in a vanilla-almond butter sauce. 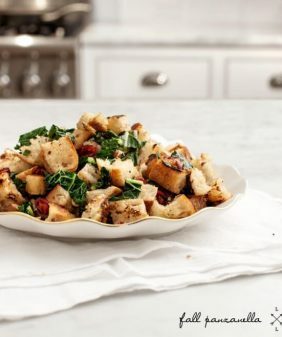 It was delicious sweet, but now I feel compelled to try it savory, especially with this recipe, yum! 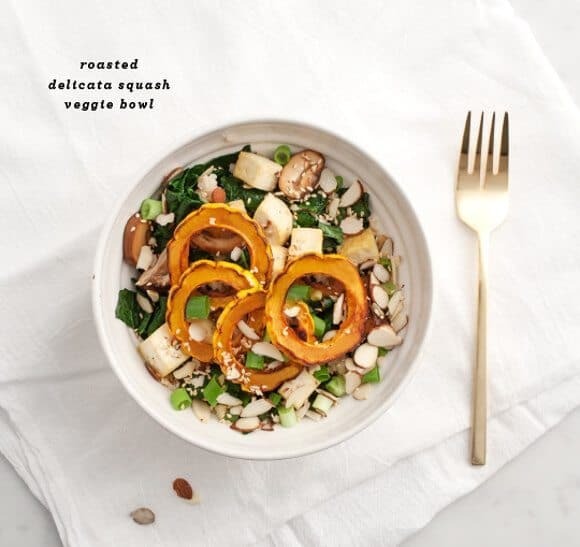 oh that sounds delicious – I never thought about delicata squash for dessert, but I’ll have to try that! I’ve been thinking about that gravy for awhile now and boy does this look delicious. I keep telling myself that moving during the holiday season is the best decision ever because with all that work, I don’t feel guilty about indulging! I’m fighting a nasty flu-like thing right now, and this looks like such a healthy bowl of immunity-boosting goodness. I can’t wait to give it a try! I made this last night for our whole family and it did not disappoint! Thanks for your tasty and healthy recipes. Love how you broke down bowl food. I’m a big fan. This bowl looks delicious and I can’t wait to try Laura’s gravy! I love an all-in-one meal that covers all of the nutritional bases. Sometimes it can be tough as a vegetarian to cover proteins, veggies and whole grains in one meal without proper planning. 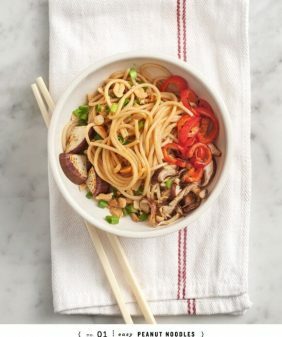 Bowls like this are perfect and quick for weeknights. And this combination looks delicious. Jeanine- Thank you so much for sharing such a wonderful recipe! It’s definitely going into regular rotation. Of course, mine was far less beautiful than yours was. But, nourishing and delicious nonetheless. Hi Jennifer – I’m so glad the recipe was such a hit!